Helen was nominated for British Designer of the Year in 1990 and 1991. She set up The Helen Storey Foundation in 1997 to promote creativity, innovation and science through the arts, as well as new models for teaching and learning. 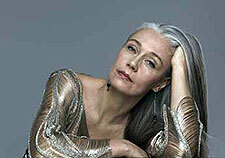 Helen trained at Valentino and Lancetti in Rome before launching her own fashion label in 1984. She exported to 24 countries selling to 150 shops worldwide and her celebrity clients included Cher, Madonna and Liz Hurley. She is a member of the 'Free Radicals' group of academics, intent on thinking differently about world problems. Helen's 'Wonderland' range of dissolving dresses questioned the environmental sustainability of our current fashion industry and what happens to used clothing, and among her most recent work is her 'Catalytic Clothing' project, which seeks to use the surfaces of clothing to purify air. She was awarded Most Innovative Designer and Best Designer Exporter in 1990, and an MBE for Services to the Arts in the Queen's Birthday Honours 2009. Helen is currently Professor and Co-Director of the Centre for Fashion Science at The London College of Fashion, University of the Arts London; Visiting Professor, Material Chemistry at the University of Sheffield; Visiting Professor, Humanities at King's College London; and Visiting Professor, Textiles at Heriot-Watt University, Scotland. "Without a doubt, my years at Kingston and, in particular, the push, belief and nurture I received from Richard Nott, defined the designer I am today. Perhaps even more than this – at a time when I had no idea if I was good at anything, he saw something in me that I had long felt was a rampant over-sensitivity towards the world. He transformed that into something that still feeds me today. Gratitude doesn't come close."